Last August, fifty people cleared enough honeysuckle to create a brush pile 10 feet by 10 feet by 750 feet long! Imagine what one hundred people could do! 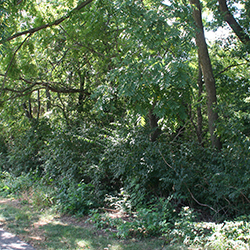 On April 6, 2013, the Harrison West Society Parks and Green Space Committee will continue its push to clear the honeysuckle from the east bank of the Olentangy River in our neighborhood. You can help. The committee, in partnership with the city of Columbus Recreation and Parks Department, Hands On Central Ohio, FLOW, and Battelle, will be hosting a volunteer opportunity that will complete a dramatic change to the view of the river along the Olentangy Recreation Trail as it passes through the northern two-thirds of Harrison West. From 9 until noon, volunteers will work to remove invasive honeysuckle and grapevine from the riverbank between West 3rd and West 5th Avenues. The southern half of the target area was cleared in August; now it’s time to finish the job. Please plan to help out and then join us for pizza between noon and 1. If we’re really good, Gretchen Farnung from Battelle will bring more of her fantastic brownies! We are looking for 100 or more volunteers to haul cut brush up the riverbank and stack it for chipping and disposal. You’ll get a great workout and do some good for the environment by chipping in to make Harrison West an even better place to live. Or think of it as an early contribution to Earth Day, which falls just a few weeks after our event. Want to help but aren’t sure you’re up to hauling brush? No problem. We need volunteers who can help check volunteers in and serve lunch. Contact Matthew Williams or Bob Mangia of the Harrison West Society Parks and Green Space committee, and tell them you want to volunteer for light duty. If you want additional information, contact the committee.